The Global Service Providers Guide is considered an invaluable reference in the chemicals management and control sector, providing the latest insights on regulatory market drivers, careers and salaries, and our industry outlook for the year ahead. The ninth edition of the Guide features the results of our annual survey to regulatory professionals around the globe, and over 30 pages of original editorial content, researched and developed by our team of experienced journalists. Global regulation: Key drivers for the chemicals management and control market, including national and regional legislation; sector regulation; supply chain drivers; new TSCA; state-level activity in US; and Asia developments, including K-REACH. Careers and salary survey results: Always a popular feature, each year we publish detailed results and interpretation of our annual careers and salaries survey, along with the latest news on skills, training, recruitment and career progression. Service providers outlook: Offering an invaluable perspective on prospects and opportunities facing the global chemicals management and control sector. This year, the increased volume and complexity of global chemical regulation looks set to keep service providers busy. Technology: What do emerging technologies offer the industry when it comes to regulatory compliance? Interview with Bjorn Hansen, director of ECHA, tracing his involvement with Europe’s groundbreaking chemicals policy and hearing his thoughts about today’s challenges. 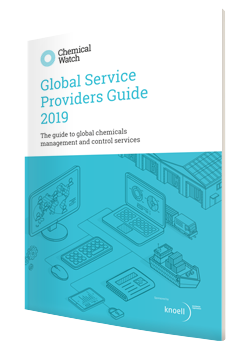 The 2018 Global Service Providers Guide also includes the profiles of 117 service providers from around the world, making it an invaluable resource for those seeking services within the chemicals management and control industry. A full service provider in global regulatory affairs for industrial/specialty chemicals, agrochemicals, biocides, pharmaceuticals, veterinary medicine and medical devices.